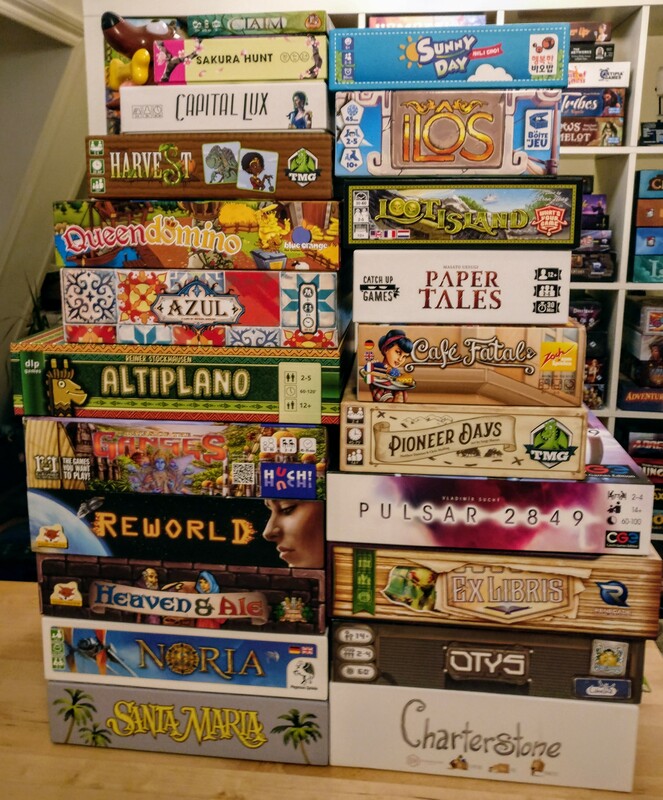 A fair as big as SPIEL requires significant planning and preparations, especially if you want to pick up the games that are a good fit for you. I did spend a lot of time preparing this year, but most of that time was actually spent on my Tabletop Together Tool, I wanted it to be even better than last year so in the months before the fair I spent hour after hour improving it and tweaking it. The end result of all my preparations was several lists printed from my tool, and a map I coloured myself (based on the priorities), a daily agenda document, a document with notes for all my meetings and last but not least printouts of all my pre-orders. Getting up early for the first day is always so exciting. Even with the slight hangover from having had a few beers with the Portal Games crew, Cedric (the designer of Lewis and Clark) and a few other board game content creators. I always try to pick up as many pre-orders as possible, along with the games I know I want. It’s a hassle to drag them around the fair and it did take me 2 trips back to the hotel and significant heavy lifting. But in the end I managed to secure 13 games and 7 expansions on the very first day. I also had lunch with half of the Tabletop Together crew, awesome to see my contributors again and have them meet each other. Also, got my copy of Queendomino signed by the legendary Bruno Cathala. Not many games played, I spent my evening reading rules while my friends played beside me in the lobby of the hotel. Friday was my main meeting day. I tried to cram all the meetings into one day, so I could have the other days off to play games and hang out with my friends. It worked as planned but it was a really a busy day. I also had to run back to the hotel with a bunch of games because I couldn’t carry anymore. I had meetings with IELLO, Renegade Game Studios, Czech Games Edition and Blackrock Games. At the IELLO meeting I got some sneak peeks of some very exciting upcoming games, both designed from Matthew Dunstan. Sara from Renegade Game Studios was, as always, a pleasure to talk to and getting my hands on Ex Libris made a great meeting even better. After that I was of to a quick stop at Portal Games booth to get my score board for Alien Artifacts signed. It was great to have a short talk with the designers of such a great game. The surprise of the day was being tapped on the shoulder when I was trying to figure out how to carry all my games. I looked up and saw none other than Tom Vasal that said “Hi Peter” and proceed to told me how useful my tool has been for him this year and that he printed out several checklists to help him out. I admit I was very humbled. Again a day with no games played at the fair, but during the evening that changed when we played Montana, Perfect Hotel and Sundae Split. Saturday I had only one meeting and the rest of the day I used to explore SPIEL ’17 without the restraints of time or carrying many games. I got my Imperial Settlers scoreboard signed by the cookie eating monster himself. Also, had a chat with Richard Ham (famous for his excellent gameplay runthroughs YouTube) about my tool. I decided to go home early and rest since I had slept very poorly the night before and was feeling a bit under the weather. After a few hours of relaxing and popping game tokens and packing games I was ready to play some games. We got a good table in the lobby and played Cafe Fatal, Ilôs and Sakura. Sunday, the final day of the fair. It’s always hard to get up early after 3 long days of walking around, playing games and drinking beer in the evening. But after a hearty breakfast it was back into the fray. This was finally the day where I got to walk around without anything planned. So I spent most of the day playing random games I thought looked interesting. There was however one thing I had planned to do. Find Shem Phillips and give him the bottle of traditional mead as a thanks for having created one of my favourite games Raiders of the North Sea. I managed to track him down (he’s was teaching 3 germans to play a french version of Raiders of the North Sea, in English) and give him the bottle and had a little chat with him about his upcoming trilogy of games set in medieval times. I had almost given up on finding a “hidden gem” this year (I might have prepared myself too well), but by pure chance I ran into Tiffany better known as “TheOneTar” on YouTube. 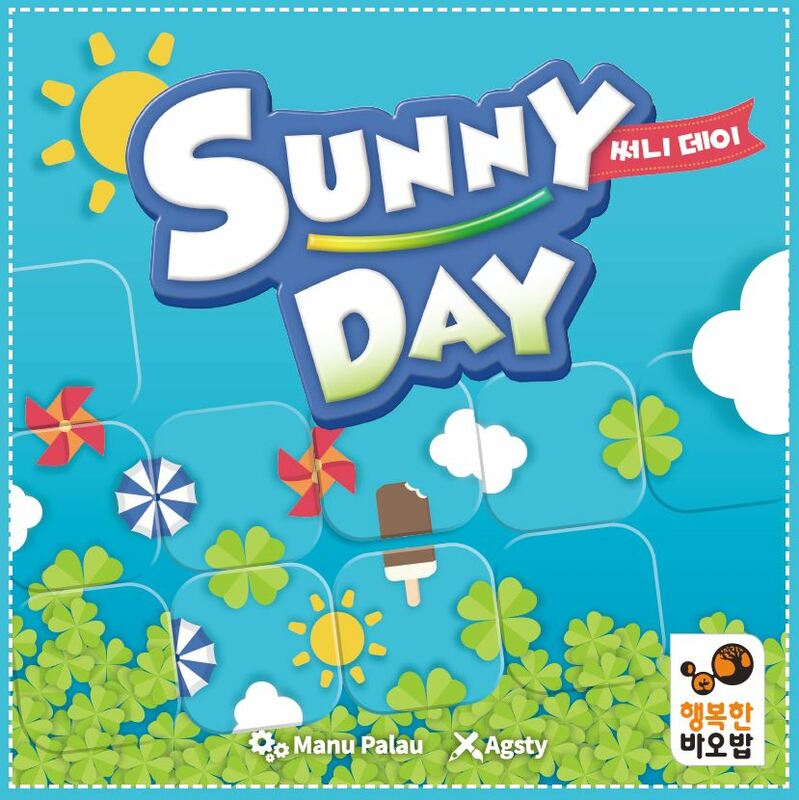 She told me about this little Korean game called Sunny Day. I quickly found some of my friends, and we went to play and we all loved it. We all bought a copy right there and then. Having already bought way too many games I decided to leave the fair about an hour before it closed to beat the rush of people staying there until closing time. Back at the hotel I got to play Istanbul the Dice Game, a game I wanted to pick up but just didn’t have enough room for, and I really liked it. But I guess there’s always that one game that gets away. While playing the game a nice Englishman asked if I was the one who made the Tabletop Together Tool. We talked a bit and me and my friends offered him to join us. We quickly find out that the man is Chris Marlin one of the designers of Pioneer Days. I quickly ran up to my room to get my copy so he could sign it. We ended up chatting for way too long (and we might have gotten one beer too many). It was the perfect way to end to SPIEL ’17.